Clinton Event Center is banquet and event center. 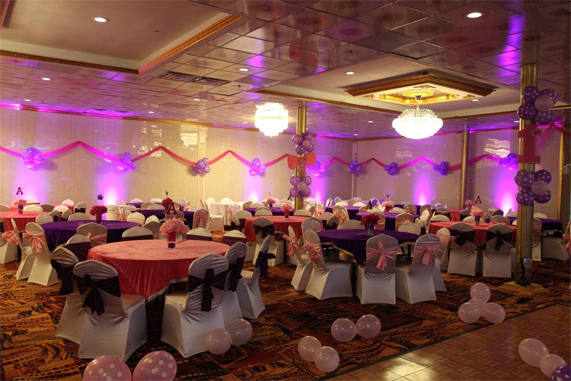 Beautiful banquet hall will be perfect facility and amenities for every special events. Clinton Event Center will features a beautifully decorated hall with crystal chandeliers and wall sconces. A high ceiling, large picture windows and a big dance floor with a platform stage attribute to the exquisite decor. Clinton Event Center's non-smoking facility offers large room that utilizes both round and long tables accommodating 75 to 300 guests. Event Center will offer on-premises food service from Taste of India through well-equipped commercial kitchen. Clinton Event Center will be available for events like marriages, receptions, family reunions, expos, seminars, training, parties, etc. Outstanding service combined with classic luxury will makes Clinton Event Center the best choice for hosting the most special occasions. Whether you envision a simple gathering with family and friends or an elaborate formal affair with hundreds of guests we can accommodate your needs. Clinton Event Center will offer packages for wedding, retirement, birthday, graduation, anniversary, baptism, confirmation, business luncheon, corporate meeting, fundraising for non-profit, community or social organizations and many other types of events. Clinton Event Center will offer many features and services to make your event special and memorable. They includes elegant and beautiful hall, decoration, linen, backdrop package, DJ, laser lights, LED light, surround sound and special Indian wedding services. Clinton Event Center will do everything possible to make sure your special occasion exceeds your expectations. Hall decorations are arranged from simple table decor up to full gowning of the entire hall. You are limited only by your imagination. Clinton Event Center offers Head Table, Cake Table, Receiving Table, and Drink Table with table cover, light and silk floral. Because each event is so different, each of our decoration is going to reflect the uniqueness of each client, their taste, cultural background and lifestyle. Hall have many choices as Rose Kiss balls, Money Boxes, Ceiling Swags, Wedding Chairs, Arch/Archway decor, centerpieces, bridal flower, etc. Clinton Event Center can also work with your interior designers and decorators.